Portable Garment Steamer Just $17.99! Down From $90! You are here: Home / Great Deals / Amazon Deals / Portable Garment Steamer Just $17.99! Down From $90! Don’t miss this amazing deal from Amazon! Get this Tadge Goods Portable Garment Steamer for just $19.99, when you apply the extra $2.00 discount coupon located below the price, down from $89.99 PLUS FREE shipping with Amazon Prime and for orders $25 or more! 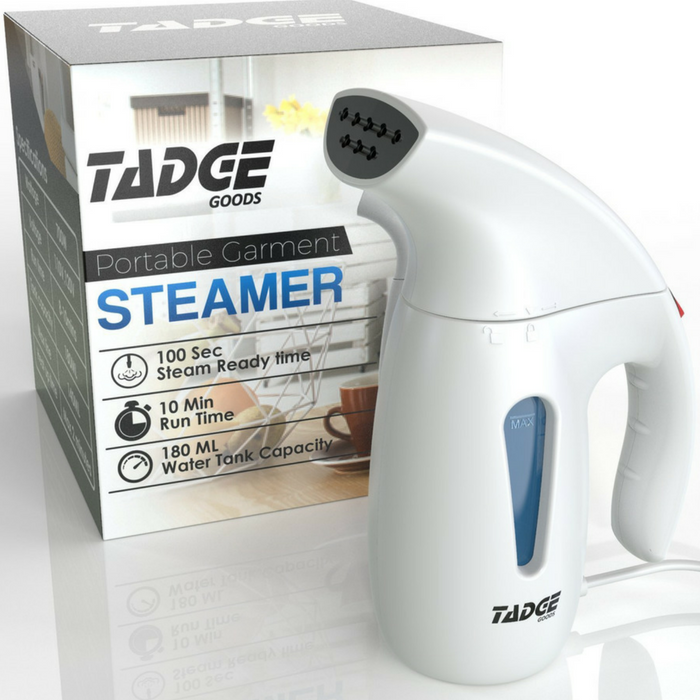 The Tadge Goods Portable Garment Steamer is a complete solution to de-wrinkle your clothes. The portable garment steamer is designed to remove even the toughest of wrinkles. It has a built-in safety system that automatically turns off when the steamer temperature gets too hot or is running low on water. Plus, it heats up in 1 to 2 minutes, making it easy to get ready for outings. No more wrinkly situation, anywhere you go! SAVE YOUR PRECIOUS TIME: Ultra-fast heat technology steams water in as fast as 60 seconds so you can steam iron your clothes quickly and efficiently to make sure you catch that meeting! REMOVES YOUR STUBBORN WRINKLES: Works on different materials and for different purposes. Whether a dress shirt, dress pants, tie, suit, or your other clothing and fabric items. STEAM IRON YOUR CLOTHES WITH ONE FILL UP EXTRA LARGE 180ML TANK: Unlike other steamers that have smaller 130ml tanks, the Tadge Goods Garment Steamer has a larger tank designed so you don’t have to keep refilling over and over again. DESIGNED FOR YOUR TRAVEL: The new black nozzle design distributes powerful steam easily throughout your garment tackling tough wrinkles. The compact design also makes it easy to store or travel with.